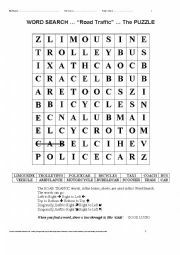 From a group of 4 words, students must decide the word that doesn´t fit, that isn´t suitable ... the Odd Man Out. They must choose 3 words and write ´Yes´ beside them, and 1 word where they write ´No´. Decisions, decisions, decisions! It tests, and also improves their Vocabulary. It´s easy to play, and great fun. 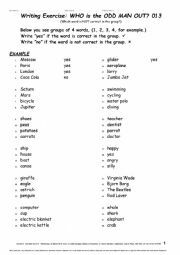 This Worksheet is one in a Series of fun activities, where students search on the grid for words. This time, it´s ROAD TRAFFIC. 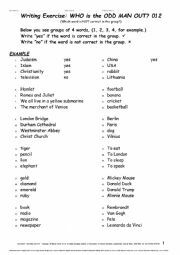 The activity teaches students Reading, Spelling, and also introduces them to new words. Good for Classroom Work and Homework. From a group of 4 words, students must decide the word that doesn´t fit, that isn´t suitable ... the Odd Man Out. They must choose 3 words and write ´Yes´ beside them, and 1 word where they write ´No´. Decisions, decisions, decisions! It tests, and also improves their Vocabulary. It´s great fun.